If you’re still giving people your old, raggedy business cards, you should probably think of joining the 21st century. I’m not trying to be snarky here, I just think it’s time to check out the newest, coolest way of giving new people your business contact info. Hello TapMyBiz. TapMyBiz uses NFC technology to make high impact networking happen in seconds. 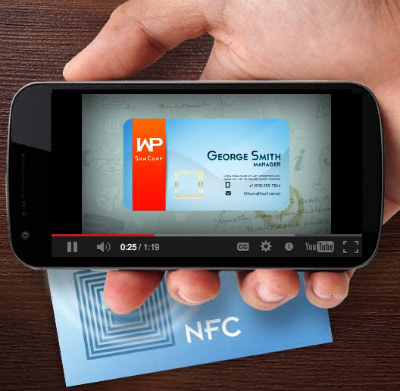 What in the world is NFC technology you may ask? It stands for Near Field Communication, and it’s a technology built into most smartphones that allows a wireless transfer of data between phones and NFC chips. Seriously, it’s that easy. There’s no app required, just a simple tap and you’ve shared all your contact info and connected with potential clients, customers and maybe even future dates. Not to mention, it’s insanely impressive. The company pretty much guarantees you a spot at the cool table at your next networking event, while your competitors grip their stack of business cards with envy. Like I mentioned, you’ll look like you’re on top of your tech game and I’m pretty sure you’ll be remembered as the guy with the, “cool electronic business card thing.” And guess what? You can link anything from social media websites to video clips so you really have a stand-out digital presence. Still not convinced of the advantage of TapMyBiz NFC business cards? Check out the, “What, Whys, and Hows,” here. And, you don’t have to take my word for it. 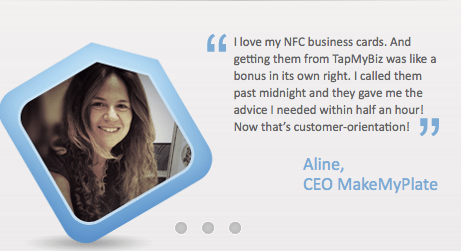 From the testimonials online, it sounds like customers are very happy with their TapMyBiz NFC business cards. From customers calling at midnight and still getting great service, to others impressing the pants off of their contacts, these state-of-the-art business cards are creating some seriously satisfied clients. TapMyBiz NFC business cards are the way of the networking future, man. I mean it doesn’t get more tech savvy than this, not to mention the eco-friendly factor from saving all those poor trees from your antiquated business card printing. Whether you’re a tech startup (in which case you should DEFINITELY look into getting these for your employees) or a smart individual, check out TapMyBiz NFC business cards and make your networking /contact-giving life easier… and much cooler.